The home selling process is long and stressful. A single misstep could see you hurtling back toward square one. If you’re selling your home, you’ve likely already started thinking about aesthetic improvements to increase your curb appeal. Some of those actions include power washing the home, painting, and landscaping. But there are a number of actions that home owners must take the ensure that their house is ready for sale and free of any problematic issues. One such measure is a residential oil tank scan. While underground oil tanks cannot be seen, problems that arise within them can be costly and lead to a potential home sale falling through. But what is a residential oil scan? Why is it so important for the home buying process? What potential issues could arise if you fail to scan your residential oil tank before selling your home? Most banks require there to be a residential oil tank scan prior to the approval of a home loan. This is in keeping with a bank’s right to demand a full home inspection before approving a mortgage. They want to be sure that there’s nothing harmful happening beneath the soil. It will make the home selling process move by at a much faster pace if you have the results of a scan ready to go for your potential buyers. What’s more, many real estate agents request that a tank scan be undertaken before they agree to list and sell a property. These professionals want to make sure that the house is sellable before they sink their time and effort in on it. Oil tanks can cause extreme damage to the property and to the environment surrounding it. As the owner of that property, you are responsible for damages that occur as a result of your home’s equipment. If your pool leaks and floods your neighbor’s yard, you’re responsible. If your oil tank leaks and pollutes the entire area, you are also responsible. If you somehow manage to sell your home without performing a scan and the new buyer discovers after taking possession that there is an issue, you could be vulnerable to a hefty lawsuit. It should come as no great shock that a leaking oil tank is a huge environmental hazard. When oil seeps into the ground it can negatively impact the property of your neighbors and contaminate nearby supplies of water. Soil and groundwater specifically could see extreme damage. Once your tank has infected the nearby area, you’re looking at a massive cleanup bill, potentially reaching millions of dollars. Imagine the hassle of removing the tank and disposing of ruined soil. That’s not a cheap venture and the entire weight of it falls directly on your shoulders. If oil vapors are seeping out of the tank, they could enter a building and start a fire. On top of that, they can negatively impact the air quality of the home, leading to nausea and respiratory diseases. What are the Causes of an Oil Tank Leak? There are many reasons why an oil tank might leak. Understanding what they are could help you realize why regular scans are important, both in times of a pending home sale and beyond. First off, you want to take the age of the tank into consideration. Older tanks have a tendency to decay, and as materials erode, leaks become possible. There are many mechanical failures which could contribute to the deterioration of your tank. Faulty valves are just one of the many potential problems. The installation of your tank has to be taken into consideration as well. A bad installation can lead to bad performance, up to an including leakage. Overfilling is another area in which your underground oil tank might start to leak. If you’re planning on selling your home, you might want to look out for a few telltale signs that there is something fishy going on underground. Leaking oil tanks leave a slew of evidence behind. The first and most telling sign that there’s something wrong with your oil tank would be a strong oil smell in the area. The spot around the residential oil tank might have a distinct smell when no issue is present, but if you move away from the tank’s location and the smell persists, chances are there is a problem. Check your storm drains or drainage ditches for oil deposits. Even the presence of an oily sheen could be symptomatic of an oil leak. If your drinking water tastes or smells funny, then you might have an issue with oil leaking into your groundwater. Another sign of an underground oil tank leak is a lack of vegetation. If the area around your tank’s location is completely dead, there has to be a reason. If you notice patches of dead grass forming, there may be a serious issue underground. If you want to ensure that the home selling process goes as smoothly as possible, it’s important to make sure that the home you’re selling Is free of major issues. A residential oil tank scan is one very important piece of that puzzle. Mikula Contracting is a fully insured and certified oil tank scanning company, serving residential properties throughout the State of New Jersey. 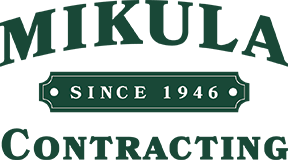 If you want to take advantage of Mikula’s more than 70 years of high-quality experience, call us today at 973-772-1684, or visit us online for more information.